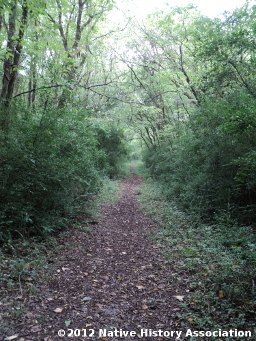 A section of the Trail of Tears National Historic Trail crosses the Old Jefferson Site, located on Corps of Engineers property in Rutherford County, near Smyrna, Tennessee. The site is near the East Fork Recreation Area and the Trail of Tears segment is part of a multi-use horse/hiking trail called the Twin Forks Horse Trail, which is open to the public. "Trail of Tears" is the term used for the several routes taken by the Cherokee during their forced emigration to Indian Territory, now known as Oklahoma, in the late 1830's. There were three main land routes and one water route. Two of the land routes and the water route originated in southeast Tennessee, and all four passed through the state. These routes are part of the National Historic Trail system managed by the National Park Service. Old Jefferson is the site of a town that was founded in 1802 at a fork in the Stones River. Several detachments of Cherokee passed through the town in 1838. The main land route of the Trail of Tears followed what is now Higway 70S from McMinnville to Murfreesboro, and on to Nashville, but the detachments that passed through Old Jefferson followed an alternate route that departed from the main route west of Readyville and passed north of Murfreesboro in order to avoid tolls on the main route. The Native History Association identified the Trail of Tears segment at Old Jefferson on September 2, 2012, while researching the Trail of Tears routes using Google Earth. Previously, it was thought that Old Jefferson, along with the Trail segment that passed through it, had been inundated when J. Percy Priest dam was built in the 1960's. The Corps of Engineers actually took the land Old Jefferson stood on through eminent domain and bulldozed the town because a miscalculation indicated that the level of Stones River would cover the town after the dam was completed, but the land remained well above water. We are in the process of developing a sign plan with the National Park Service which will allow the Trail of Tears segment at Old Jefferson to be marked with offical Trail of Tears National Historic Trail markers. The East Fork Recreation Area has a picnic area with one covered shelter and several open-air tables. There are restrooms at the picnic area. The nearest places to buy food and drinks are a few miles away. Update - 1/24/2014: The picnic facilities have been closed due to budget cuts. The road to the picnic area is closed with a gate, and the restrooms are locked up. However, the trails are still open. If you want to visit the Trail of Tears segment, just park in the large horse trailer lot to the right of the gate on the picnic area road and walk the short distance (probably less than a quarter of a mile) up the road to the picnic area. Then follow these Illustrated Hiking Directions To The Trail of Tears Segment. There is also a printable version of the hiking directions below. Old Jefferson - Google Maps: To get driving directions use Central Valley Rd & E. Buckeye Bottom Road, Murfreesboro, TN 37129 as the destination (do not use East Fork Recreation Area as the destination, even though that's where you're going - that location is placed incorrectly on the Google map and it may take you out of your way only to end up in the wrong place).